How does climate change affect your habitat? Participating artists should respond to the brief and the theme of evidence of climate change. In researching a personal but informed response to the topic, dialogue/collaboration with scientists is encouraged. Using film as a medium, the complex issues at hand should be transformed into dynamic but simple audiovisual experiences with both popular and critical merit. The work may not be longer than 4 minutes. Brevity is strongly encouraged. Please e-mail a brief proposal of what you are planning to do (or documentation of existing work that fits the brief), along with any images and online links to relevant previous video works by July 302011. These proposals are to follow the format provided below. Postmark deadline: 20 September 2011. Final video works must reach us no later than 30 September 2011. Entry forms will be sent to artists who have made it through the first round (proposals). The films will be screened in a mobile cinema in local communities and on the COPART Climate Train, travelling by rail through South Africa and resident at the COP17 global climate conference in Durban in November 2011. Thereafter, selections of the programme will travel to international film festivals. artists. These details will be finalized in August/September 2011. It is confirmed that the COPART climate train has been allocated a significant amount in government and corporate sponsorship. This call is an extension of the call for contributions to the climate train sent out by COPART in April 2011. For more info, see http://www.letters-from-the-sky-project.blogspot.com. Millions of people and animals will lose their habitat due to extreme weather events like hurricanes, droughts or flooding. Daily, people around the world are observing evidence of climate change in plant, insect and animal life. 'Letters from the Sky' collects emotional data about your inner and outer climate, your home, values, and how that affects the environment we share. The earth is talking to us. Talk back. Send us your weather report from home. Fueled by news media spectacle, we have entered an age of uncertainty. Collectively, through international media, we have seen a dramatic increase in droughts, floods, heatwaves, coastal storm surges, hurricanes, earthquakes and tsunamis. Raw oil and nuclear radiation has leaked into the sea. These earth changes, while not all strictly linked to climate change, resound in our global awareness. one social movement that touches all of us, regardless of ethnicity, gender, class, age or creed. Climate change is the youth movement of the 21st century. Artists are asked to respond with their hopes, fears, dreams and nightmares. 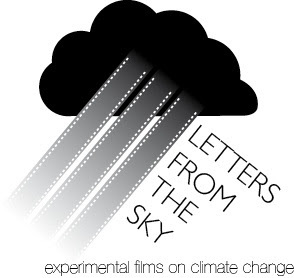 'Letters from the Sky' seeks the problems, the evidence, the solutions. How does climate change impact on your home and your community, now and in the future?